Digital products company Times Internet has announced the launch of its interactive live gaming and entertainment show ‘BrainBaazi’. The show follows on the heels of Times Internet’s digital strategy and reimagines live video entertainment. Audience participation is facilitated through a downloadable app, currently made available on the Play Store for android devices. Thinking digital-first and reimagining what mobile video entertainment could be, BrainBaazi was built, a completely new format for video entertainment. It’s a live trivia show with real participation from the people who watch it. It’s engaging, exciting, and the thrill isn’t just watching someone else but actually being in the show, as someone with a chance to truly win. BrainBaazi was built using the latest and strongest technologies. A stack of codecs was carefully put together along with proprietary handling of cues and quiz payloads to ensure real-time delivery of video and questions to millions of users with high diversity in devices and bandwidth. It is brought to a wider audience with the aim to see this as the first true primetime show for millennials, with a reach that is competitive with television, and the engagement of an immersive digital product. “BrainBaazi is built for India with a deep understanding of the nuances of its consumers and the infrastructure. 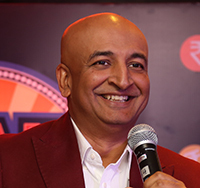 It’s a major technical challenge to be able to have a real-time, responsive and live show at that scale every day, and we’re excited to put our platforms to the test,” said Gautam Sinha, CEO, TIL.